Quick and simple to attach, this additional front roller gives you the freedom to weave longer lengths of fabric and the freedom to weave with thick weft yarns, all the while keeping the optimum sheds. Now you can weave double width projects with ease, weave rag or rya knot rugs longer and thicker, weave with super yarns, and weave multiple projects without cutting and re-leashing the warp. Kit includes Freedom Roller with clicker pawl, warp stick and warp stick ties. When using your Freedom Roller, there is no need to cut off the warpstick on your original roller. Simply turn the original roller so the warpstick and ties are down, out of the way of your warp going on the freedom roller. 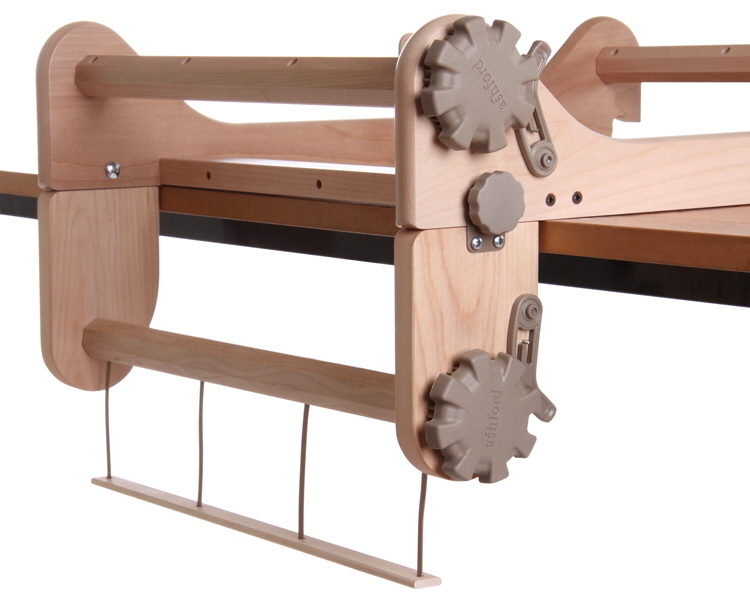 Leave the knobs on your loom and you can quickly switch between using the loom with or without the Freedom Roller. The Freedom roller cannot be used with the Rigid Heddle Stand, it is designed to use on a table top.